This week Lindor Reynolds wrote about a woman whose life path had brought her to the doorstep of Osborne House, unable to afford rent for an apartment with both her sons, a circumstance which forced the older boy to move in with his father. Osborne House executive director Barbara Judt says shelter staff work closely with clients and Manitoba Housing to try to find safe and affordable housing. "It's challenge," she says. "It is a challenge. There is a shortage." Judt says women are often forced to use their food money to top up rent. Osborne House offers food hampers and donations when women move out. They can receive furniture, clothing and toys. Many women flee their homes with little more than their children. "There are a lot of people in need," Judt says. In May, I appeared at Executive Policy Committee and City Council and told our mayor and councillors to think about earmarking tax dollars from the Canadian Museum for Human Rights to groups such as Osborne House, MacDonald Youth Services, or food banks, rather than unanimously voting it be rebated to the pet project of millionaires (which could surely raise a paltry $3.6 million 12 years from now when the kickback would be handed over). I cannot repeat the personal attack made about me at city hall, for daring to suggest that the concerns of Osborne House and other social service agencies, charities, and worthy causes be an option for that money. I believe Lindor Reynolds has proven my point on that one - but it isn't only the priorities and attitudes of city councillors that she should be calling into question. We were to kick off a major fundraising campaign for Osborne House on the day the show was canceled, November 8th. Barb was coming into the studio with one of her clients to tell the campus radio audience about their challenges, and we were going to do something about it. Our target was to generate $10,000 by connecting OH with listeners, sponsors, and supporters of TGCTS, and doing ongoing segments and special live events. No one who reads Lindor's column, will have any doubt that Barb Judt could have used our reach to help her clients and their children. And no one who listened to our radio program would have any doubt, the community that participated in our show would have rallied to this cause. 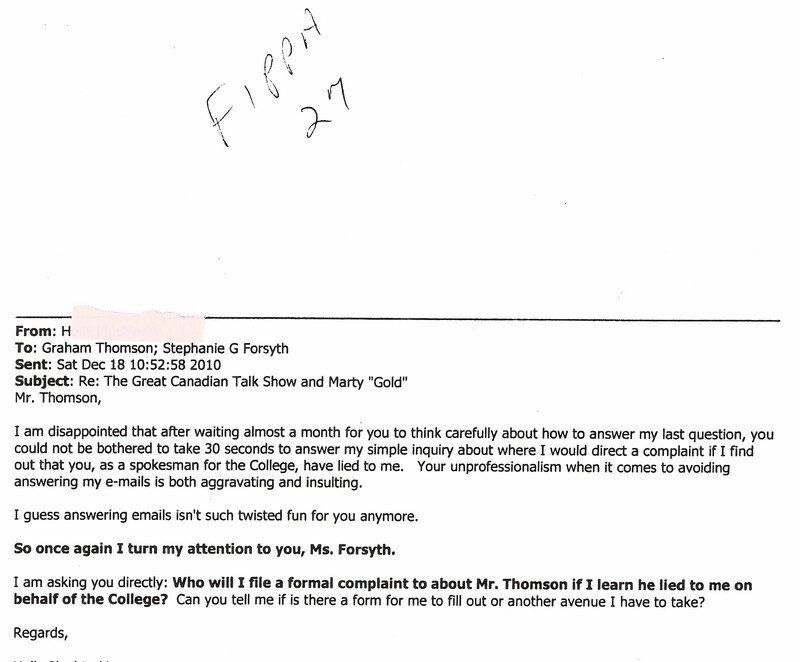 Two people who did not listen to the show, were Red River College president Stephanie Forsyth, and Lindor's boss, Winnipeg Free Press editor Margo Goodhand. After some "communication" between them, the show was suddenly made to disappear by the imaginary "Executive Committee" with no notice, after bypassing the authority of the station manager. The first person outside of the RRC/Kick-FM/ WFP triangle to hear a leak about the show on the chopping block, was Barb Judt, 3 days before it happened. When she started asking questions, College officials misled her about what was being done to the show and why, misled her about being on the Board of Kick-Fm, and tried to hide their involvement with the decision to silence the voices of women and children and ashcan the fundraising campaign. The person who directed the cancelation, Stephanie Forsyth, didn't care about the resulting effect on the women's shelter or other community causes. Heck, Forsyth didn't even care there were rules about how complaints about Kick FM shows were to be handled. Forsyth did seem to care about what Margo Goodhand had to say, even though Margo admitted that she had never listened to the show and therefore, also didn't care about the work we were doing with Osborne House, or about the community and students who participated in our show. Or even though the newspaper claims to care about fair treatment for radio shows -- outside Manitoba. Six months later, when I brought Barb Judt's message to city hall, a councillor crowed about how I had been eliminated from the media and mocked the sincerity of my advocacy. The people disagreed. Clients like 'Barb Stevens' have needs, and canceling TGCTS has not made the need go away. All it did it was make it harder for the public to learn about that need, and about how to contribute. Aside from voting in civic elections and calling the mayor's office with complaints about bike paths and holding the bias of mainstream media to the light of truth, TGCTS proved to listeners that You Have The Power to help local agencies by getting straight information about their work and the hurdles they face from bureaucracies and the donor fatigue caused by the monolithic Museum. Perhaps Lindor should find out, why a city councillor, the College president, and her own editor think it was acceptable to take that power away from Winnipeg campus radio listeners who relied on TGCTS, and ask, exactly whose interest it served to silence our platform from Osborne House and the public? And while she's at it, Lindor could ask what those 3 friends of rich and influential folks have done with their own power, to help Osborne House replace that $10,000 in the last 6 months? On second thought, I am sure Lindor could find out from Barb Judt if she calls her to ask. It won't be a long conversation. PS - It has come to our attention that Kick-FM Board director Russ Tyson walked the plank yesterday at the Corus-held GROOVE 99.1 jazz station, where he served as program director. It didn't take long for listeners of 92.9 Kick FM to smell the stench of censorship behind the sudden cancelation of The Great Canadian Talk Show on November 8th. "Curious how 2 outside mainstream media GM's (such as ) Golden West radio stations have that much input over a campus radio station. as someone who listened and financially supported GCTS and also 92.9KickFM by buying advertising, I'm thoroughly disgusted and embarassed to be an alumnus of RRC"
"This is a really sad day for free speech in Winnipeg and please, it's very very bad for public relations of RRC - it's really horrible, so please pass this along to people who make that decision. They made a very bad decision not just for RRC and CreComm but for radio listeners in Winnipeg. This is incredible and unbelivable." Krueger, who has never had any actual connection to the radio station, threw in the towel after 3 hours. That resulted in College PR experts crafting the infamous Stephanie Forsyth approved "statement" for the supposedly independent stations' website, about a "reorganization" ... "giving students more opportunity." "Your email was passed on to me, as the programming change was made by KICK FM, and not by Red River College. In case you haven't seen it, a statement is available on the station's website, at www.kick.fm. We appreciate your comments, and I will be communicating them to the board. To provide a bit more information, the core purpose of the station - in fact, the reason it was created - is to train students in the Creative Communications program. The purpose of the change is to provide better on-air opportunities." Thomson ordered the statement removed the next month, and official records show the outraged comments of listeners and their demands for truthful answers, were never tabled with the Board of the station by Thomson. A lady listener, 'H', didn't trust Thomson's stock answer, and challenged his giving her the official brush-off. "You'll have to excuse my bluntness, Mr. Thomson, but I am not interested in a cookie cutter response from you; I want a timely response from Ms. Forsyth and not a second-hand spokesman. The coincidence that CFRW, with a new sports talk format, picked up the second most popular program, Illegal Curve, the same week they used their vote to kill the most popular talk show on 92.9 KICK FM is a conflict that Ms. Forsyth herself must address as the college funds the station, as I understand it. To summarize: Ms. Forsyth has some explaining to do. Hiding behind this poor excuse that you want to give students more training time is completely absurd as everyone knows students were getting on-the-job training with The Great Canadian Talk Show. That, Mr. Thomson, is the best "on-air opportunities" KICK FM could have provided for their students. No one is buying into the "official reasons" given for cutting The Great Canadian Talk Show and I am sure most people can see right through it. I would then ask for a timely response from Ms. Forsyth and not you or some other lackey. 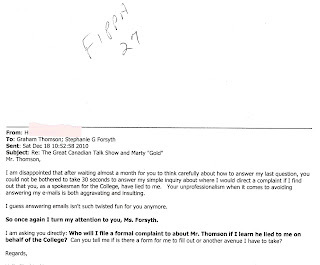 "Graham Thomson, the college’s dean of business and applied arts and a non-voting executive member of the board that canned the show, acknowledged that the Winnipeg Free Press contacted president Stephanie Forsyth, but denied any outside influence." "H" went right back with more questions for Thomson and Forsyth, which Thomson again tried unsuccessfully to deflect (in red). 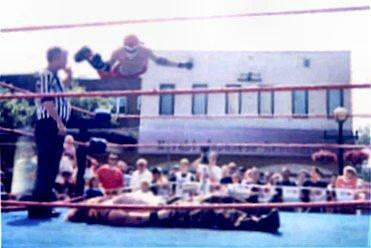 Subject: Re: FW: The Great Canadian Talk Show and Marty "Gold"
1. Why you only told half the story in your news releases and didn't mention anything about Ms. Forsyth, a known NDPer, speaking to one of the board members about the Free Press contacting her. (Thomson reply) Please don't assume that the National Post reported with complete accuracy. The change in programming was made by the executive alone, based on the core mandate of the station. Comments to any directors, from ANY outside sources was of no consequence. 2. What was in the communication between Ms. Forsyth and the Free Press, and why was it not put in writing and sent to the station manager? I don’t know the content. It would be up to the Free Press, or anyone else to comment directly to the station manager, but I think that, from time to time, comments have been passed on to the station manager. 3. Why were students and faculty not asked about the change? There’s no mandate for this in the bylaws or anywhere else. The station is separate from the college, although it’s purpose is to provide training. 4. Why were no alumni who advertised or appeared on the show contacted? Again, no mandate for this. The decision was made to increase on-air opportunities for current students. "Comments to any directors, from ANY outside sources was of no consequence." Are you saying that the executive had no communication with the college president? Think carefully before answering. 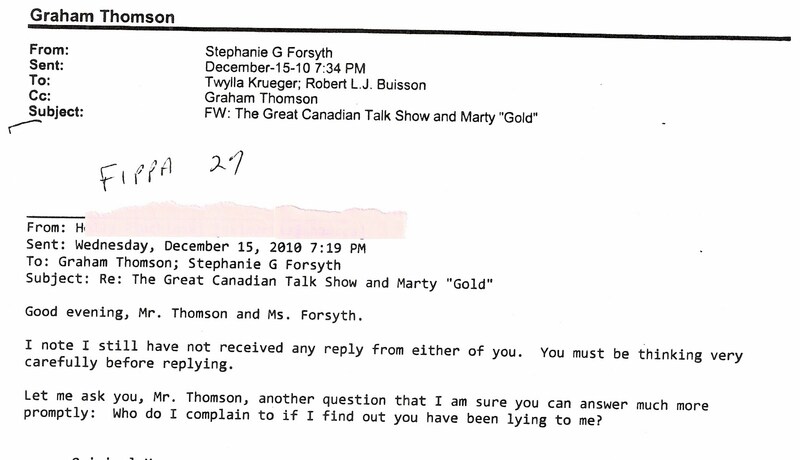 Ten days later, she reminded Thomson, and even tried to help prompt a response by suggesting what the National Post might have misunderstood about his explanation. Mr. Thomson, I waited a week for you to answer. Your claim that the National Post story was inaccurate surprised me. Have you complained to the National Post and asked for a correction? According to details attributed to you in their story, the RRC President did indeed have contact with at least one KICK FM executive committee member, who is also an employee (Vice President) at RRC. That Vice President was, again according to you, made aware about "concerns" the Winnipeg Free Press had concerning TGCTS which they told Ms. Forsyth about. That same Vice President, and (at least) one other RRC employee on that Committee, went into a meeting and suddenly voted to cancel Mr. Gold's program after four years without any discussion or consultations with the station manager or Mr. Gold. Correct me if I have gotten the wrong impression from the National Post story, but wasn't that "other" employee of RRC on the KICKFM Executive Committee also made aware of the Free Press "complaint" to Ms. Forsyth before voting to cancel the show? In other words, did both RRC reps know about the Free Press having contacted Forsyth, or only one of them? The story reported only one of the RRC reps, the Vice President, was aware of it and I was wondering if that was the inaccuracy you referred to. Thomson wanted no part of backing up his claim about the National Post report, or explaining the role of Creative Communications chair Larry Partap on the "Executive Committee" - having already had to admit Partap's participation to Osborne House director Barb Judt that same day, after Partap clammed up when she had asked him about who the "Executive Committee" was. Thomson kept his fingers away from the keyboard, so a few days later, 'H' sent a reminder that she did indeed, expect transparent answers from RRC. Am I going to get a response to my e-mail of November 29, 2010 (below for your ease of reference) any time soon?
" I note I still have not received any reply from either of you. You must be thinking very carefully before replying. Let me ask you, Mr. Thomson, another question that I am sure you can answer much more promptly: Who do I complain to if I find out you have been lying to me?" It must have alarmed President Forsyth that the public dared to expect accountability and honesty from her College officials. 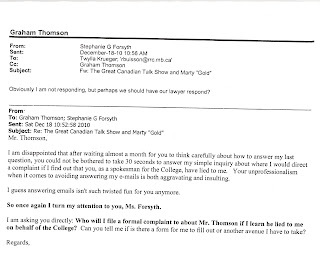 Because as the use of exemption code FIPPA 27 to blank-out part of the email below proves, before Thomson could be allowed to answer the question about the College complaint procedure he would be investigated under, Forsyth ran to Krueger and College lawyer Robert Buisson with some sort of, um, legal issue. Three days of silence later, the gloves were off, and 'H' went over Thomson's head and straight to his boss for the answer. I am disappointed that after waiting almost a month for you to think carefully about how to answer my last question, you could not be bothered to take 30 seconds to answer my simple inquiry about where I would direct a complaint if I find out that you, as a spokesman for the College, have lied to me. Your unprofessionalism when it comes to avoiding answering my e-mails is both aggravating and insulting. I guess answering emails isn't such twisted fun for you anymore. 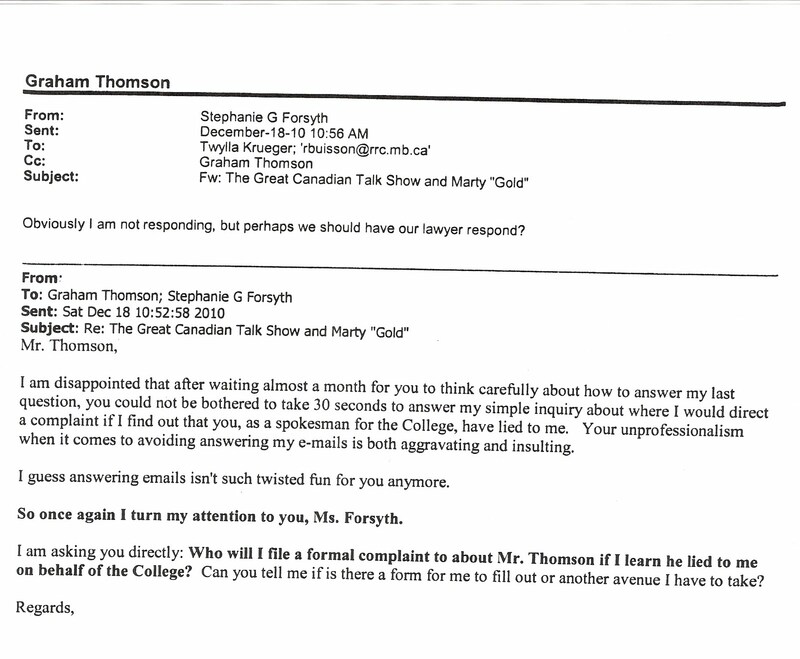 Who will I file a formal complaint to about Mr. Thomson if I learn he lied to me on behalf of the College? Can you tell me if is there a form for me to fill out or another avenue I have to take? Forsyth fired off an email that Saturday morning to her minions and made clear her contempt for 'H''s notion that the College President - of all people! - had to be accountable to provide information about the College's formal complaint process, and tried to pass the buck. "Obviously I am not responding, but perhaps we should have our lawyer respond?" she wrote to Krueger, Buisson, and incredibly, the man under the proposed investigative microscope, Thomson. A week before Christmas, Robert Buisson for some reason, had to apply his lawyers' hat to the simple question about the public wanting to know how to complain about a College official. But Section 27 of the FIPPA legislation doesn't allow us to find out what his rather lengthy legal advice was that day, to Thomson and Forsyth. His advice, however, can be deduced quite simply from the facts. 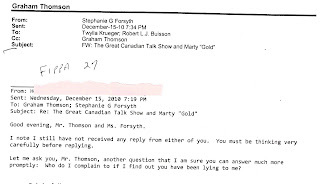 1) The concerned listener wanted to file a complaint about Graham Thomson for trying to mislead her that "comments to any Directors (of Kick FM) from ANY outside sources was of no consequence", after he admitted to the National Post that Forsyth - an outside source - had a discussion with the College representative on the radio station Board (Cathy Rushton) about the Free Press speaking with her about Marty Gold. 2) Buisson had replaced Cathy Rushton, on the Kick-FM Board on December 14th. 3) Which hat (Director on the Board of the non-profit radio station? College lawyer?) Robert Buisson was wearing at any particular moment is hard to know. However, complaints filed under the College Ethics Policy would usually be investigated by Corporate Counsel - the same Robert Buisson who apparently gave Forsyth and Thomson advice in December about 'H' asking for a complaint process that would also involve him. 4) To this day, 'H' has never received an answer from Red River College about the formal complaint process, so she could have Dean of Business Graham Thomson held accountable. She has heard only silence in response. What bands are playing Canada Day at the Zoo, you ask? 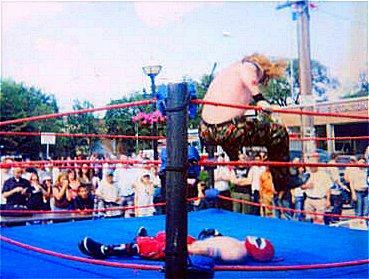 I was involved with the Canada Day celebrations out of the Osborne Village Inn - the Zoo - in its formative years in the 1990's, and then again in the mid 2000's. 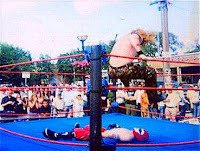 In fact, among my proudest accomplishments in entertainment was hosting and producing our own branded Rough House Rasslin' events, where families and fans enjoyed the skill and science of wrestlers like Chi Chi Cruz, Bruiser Bastien, La Sombra and many more. Chuck Green gave us a tremendous opportunity and the lasting memories for the performers and the fans are part of his legacy. Right, Horse? Every year a hundred thousand people or more pass down the street and renew old friendships, sample food and fashion from local stores, stroll to the vibe of live local music, and enjoy the freedom to be Canadian. It's a sea of harmony and good feelings. Bands & Beer Gardens! Free Admission! Cathy Rushton, the longtime Vice President for Finance and Administration of Red River College who has been under intense scrutiny after internal emails revealed her part in orchestrating the cancellation of The Great Canadian Talk Show on Kick-FM at the behest of College president Stephanie Forsyth, is apparently no longer employed by the campus. Over the weekend, bloggers noticed a sharp upswing in internet searches for "Cathy Rushton" with some interesting adjectives added that indicated what could politely be described as a parting of the ways. When I called RRC today and asked to speak with Cathy Rushton, they advised me that she wasn’t in. When I asked when would she be back, I was told that she ‘would NOT be back at the College’. Other sources confirm her departure, suggesting that Rushton officially hit the bricks last Friday, June 3, right after the spring convocation and before this weeks' golf tournament. The timing would be exactly two weeks after the CRTC received an official document from Kick-FM admitting that its 4 member "Executive Committee" (which included Rushton and RRC administrator Larry Partap last November and claimed it had the authority to arbitrarily cancel TGCTS) did not have any legal powers whatsoever under the Bylaws or voted by the Board of Directors. The document, on Red River College letterhead, was a response to an official complaint sent to CRTC chair Konrad Von Finckenstein by a concerned listener. CRTC rules are very strict about requiring care and control of campus radio licences by a balanced Board of Directors at all times, yet the document indicated the "Executive Committee" (made up of the officers of the corporation) has been making decisions on short notice for years about the station without consulting the other directors, supposedly telling them after the fact what the foursome had done. Manitoba Companies Office filings show Rushton was an officer of Cre Comm Inc, which holds the radio licence, from Day 1 until Dec 14, 2010. The listener had meticulously collected and cross-referenced emails, official records, and media reports to raise extensive questions about whether CreComm Radio Inc was breaking CRTC rules and its own Bylaws in the way it handled financial and conflict of interest issues, conducted its corporate affairs, and structured the Board of Directors. - misinformed the Board in December after it heard Gold's appeal for reinstatement saying that federal Treasury Board minister Vic Toews had complained about the show, when Toews had actually questioned Thomson and Forsyth about the rumours regarding the Winnipeg Free Press being behind the cancelation. Want to hear us return to a regular audio format ? email: martygoldlive@gmail.com for more information on how you can help make it happen.